The Quay Brothers: Into a Metaphysical Playroom. Minneapolis: University of Minnesota Press, 2010.
ensconced in the space between dreams and wakefulness, fantasy and reality—are the focus of Buchan’s insightful, eloquent, and thought-provoking book. Attempting such a thorough exploration of the oeuvre of two directors whose films belong to a realm of oneirics, pscyhotopographic flaneurism, and metaphysics” and, as the author herself puts it, “resist unambiguous classification” is both a daring gesture and a challenging task (p.52). Still, Buchan completes her ambitious project with confidence and skill, as well as a contagious admiration for her subject matter. Offering descriptions and analyses of the unique features of the twins’ style and approach, a thoughtful and articulate discussion of viewer response, and biographic accounts, she takes her readers on an exhilarating journey through the Quays’ body of work, providing the theoretical background and context necessary for better understanding and deeper appreciation of the brothers’ films. Instead of attempting to cover the entirety of the Quays’ wide-ranging oeuvre in equal detail, Buchan opts for a simple, yet productive solution which she has appropriately dubbed “synecdochal analysis.” The author focuses her discussion on Street of Crocodiles (1987)—arguably the Quay’s most exquisite and well-known film to date—using it as a centerpiece of her book, an illustrative example of the Quay’s aesthetic and techniques, and a springboard for thematic, stylistic, and conceptual connections to the twins’ other works. The book’s first chapter, which aims at dispelling the mystery surrounding the enigmatic brothers without ultimately destroying their aura of fascinating inscrutability, is a detailed and informative biographical sketch. It traces the Quays’ geographic and professional journeys from Pennsylvania to England and from art school to filmmaking, showcases their work in book design and illustration, and chronicles their early efforts at producing and financing their films. This section also sheds light on the development and nature of the Quays’ relationship with longtime producer Keith Griffiths and his impact on their creative output. The following chapter, which explores the literary roots of the Quays’ films, is an example of the author’s effective transtextual approach. In it, Buchan offers a rich, multi-faceted analysis of the directorial duo’s aesthetics and content by drawing theoretical and conceptual connections to literary themes and stylistics. This chapter focuses on three writers who have inspired the directors: Franz Kafka, Robert Walser, and Bruno Schulz. Buchan devotes the most attention to Schulz, the author who “offered the most inspiration for the Quay Brothers’ own cosmogony” and whose short story “The Street of Crocodiles” is the source for the Quays’ short film of the same name (p.59). This discussion sets the stage for the next four chapters, which will be devoted to a multi-layered and systematic close reading of Street of Crocodiles as a case study representative of the Quays’ work as a whole. Thus, chapter three takes the reader on an enlightening tour of the short film’s disorienting architecture, while chapter four focuses on the directors’ distinct and stylistically diverse puppets, discussing the ways in which these “artificially constructed, defamiliarized representaitons” succeed in engaging the audience (p.117). The book also features a detailed analysis of different technical aspects of Street of Crocodiles, such as editing, lighting, camerawork, and sound design. In its last portion, the text zooms out from Street of Crocodiles in order to introduce a wide variety of lesser-known, yet equally fascinating projects by the twins: opera, ballet, and play set designs, music videos, commercials, and dance films. Finally, chapter eight completes the narrative of the Quays’ gradual move towards feature filmmaking by offering a reading of their completed full-length live-action films, Institute Benjamenta (1995) and The Piano Tuner of Earthquakes (2005). Suzanne Buchan has crafted a meticulously researched, well-structured, and convincingly argued analysis. However, what truly sets her text apart is its personal, intimate nature. 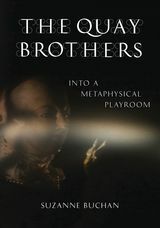 Born out of a long-term interest in and acquaintance with the Quay Brothers, it is at once an elegant and rigorous scholarly discussion and an intimate glimpse into the private poetic universe of the twin filmmakers. Indeed, the book is enriched by the author’s selection of anecdotes and candid, often provocative quotes by the Quays, as well as from the illustrative materials taken from the directors’ personal archive. Without reading like a dry biographical account, Buchan’s text is nevertheless surrounded by an aura of authenticity which leaves the reader with the satisfying impression of having gained access to an ”authorized” version of the Quays’ career. Buchan’s book is not only an important and timely contribution to animation scholarship, but a call to arms. As the author herself points out, if she does not reference other formal analyses of puppet animation, it is not out of unwillingness to do so, but because few of those exist (p.xix). Though the author cannot single-handedly compensate for this pronounced lack of studies on the subject, the questions she has raised in this study will hopefully inspire further research into this unjustly neglected area of filmmaking.